Practice One for the Bommarito Automotive Group 500 at Gateway Motorsports Park is now in the books. As expected, it was pretty much dominated by Chevy. Those in the know tell me that this track will behave a lot like Phoenix which, if you’ll recall, was also dominated by Chevy last April. 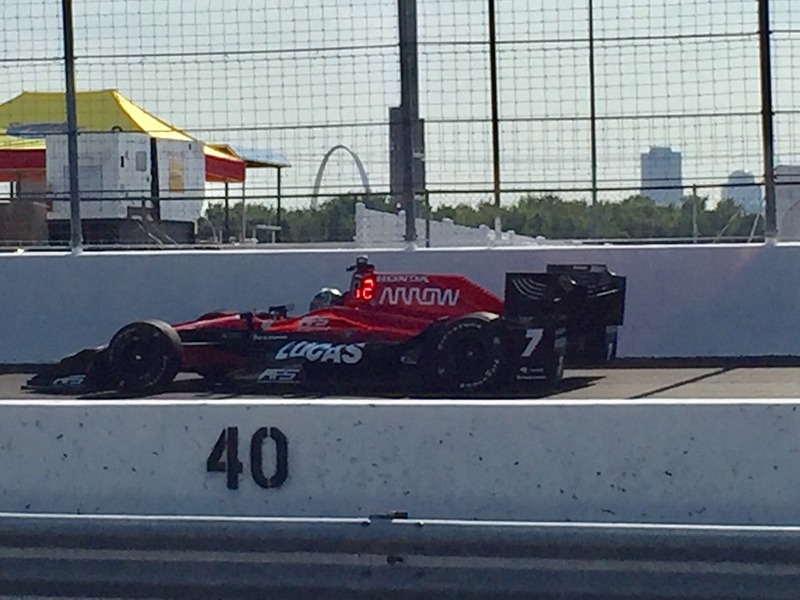 Will Power turned the quickest lap with a time of 24.2521 seconds for a speed of 185.551 mph. Which reminds me…in this morning’s post, I listed Raul Boesel’s track record at Gateway as 223.871 mph. I thought that seemed awfully fast, but the website I was using had that on there. I figured that if it’s on the internet, it’s got to be right…doesn’t it? Fortunately, there are a lot of savvy readers here. Billy the Skink posted the corrected track record – a more believable 184.146 mph. Does that mean Power has broken the track record? If he posts the time he did in practice, then yes. 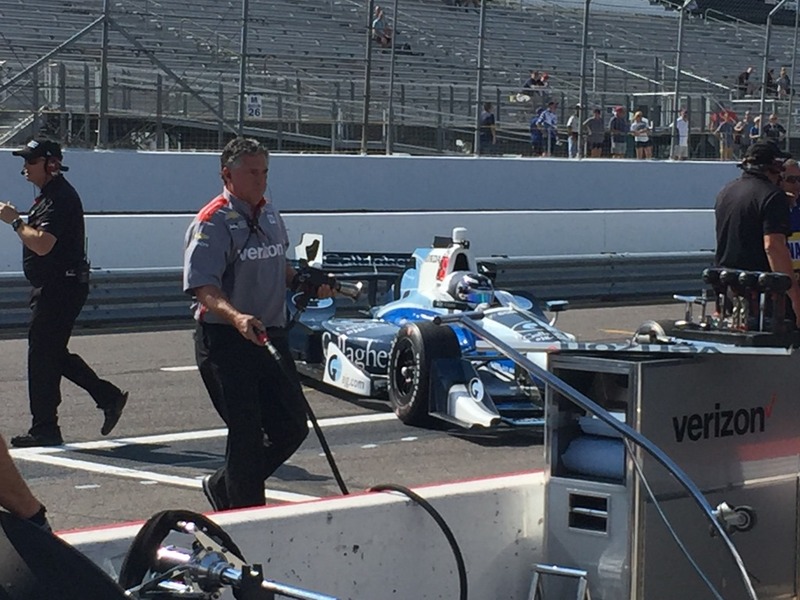 Not only did Power post the quickest time, but the top-four speeds were all posted by Team Penske drivers in the order of Josef Newgarden, Simon Pagenaud and Helio Castroneves. Surprisingly, Ed Jones of Dale Coyne Racing posted the fastest Honda time and was the fifth fastest overall. Conor Daly proved that his testing time here back in the spring was no fluke, as he posted the seventh fastest time. The only mishap of the session was when Max Chilton spun exiting his pit and nearly spun into Will Power’s crew. Earlier, I may have complained about some logistics problems here, but so far – I like the facility. I keep hearing the old timers speaking of how they have improved the place. I don’t know how bad it was before, but I see no problem with the place currently. The track looks a lot bigger on television than it does in person. With the MRTI ladder series here, the paddock is crammed full. Consequently, everything in the infield is tightly packed. I stood at pit-in during practice and took this short 12-second video watching some cars go through Turns Three and Four. I was also able to catch this shot of Sebastian Saavedra going by, with the St. Louis arch in the background. 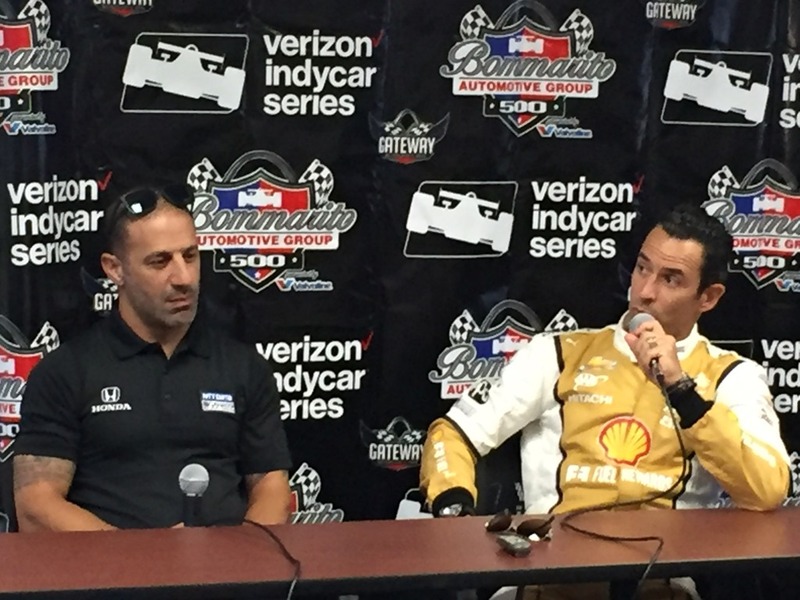 There was also a press conference just before practice with Tony Kanaan and Helio Castroneves. Oher than some comical banter between the two Brazilian drivers that have been lifelong friends, there was nothing of real substance t come out of it. That’s going to do it for now. Qualifying is coming up at 6:30 local time (central), and then there is a final practice from 9:00 to 10:00. Check back later. This entry was posted on August 25, 2017 at 6:00 pm and is filed under IndyCar. You can follow any responses to this entry through the RSS 2.0 feed. You can leave a response, or trackback from your own site. 9PM. another race my son won’t see.